Two New York Times bestselling authors, Gregg Olsen and M. William Phelps, with nearly 3 million books in print between them, team up for the first time to package their first novels, two complete, full-length books, equally as shocking and awe-inspiring, into one, bargain-priced box set that will not only have you turning pages all night, but trying desperately to shake off the chill down the back of your spine … Indeed, Phelps’s serial killer and Olsen’s seemingly mild-mannered reporter provide cold, heartless and brutal revelations that will scare the daylights out of readers long after the final pages of each book is read. In SHOCKING TRUE STORY, Gregg Olsen’s first full-length thriller, Kevin Ryan is a writer in the much-maligned genre of true crime who desperately needs a devious, over-the-top story for the subject of his next book. How else can he keep his wife Valerie’s roots dyed, her face lifted and keep himself from handing out taco samples at the local supermarket? When Kevin isn’t Googling himself or spot-checking his books’ stock at stores around the country or his Amazon sales rank numbers, he’s bringing the hazards (i.e., criminals and other crazies) of his job home to wife Val and twin daughters Taylor and Hayley. Kevin is on the hunt for the big one, the story that could break him out of the midlist and onto the top of the bestseller charts. 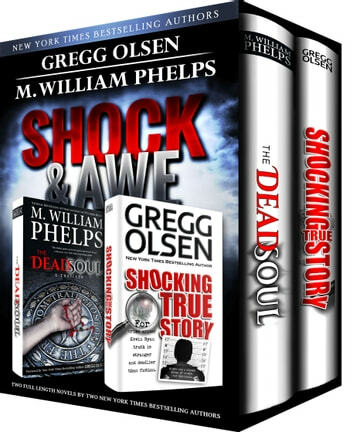 In THE DEAD SOUL, a first novel, serial killer expert, star of Investigation Discovery’s hit series “Dark Minds,” author of 27 books, award-winning journalist M. William Phelps compiles his decades’ worth of crime experience into one hell of thrill ride. Phelps takes readers into the twisted world of “The Optimist,” a sadistic serial killer—based on Phelps’s ten years of research and writing about serial killers (five books)—bent on not only terrorizing his young female victims, leaving their naked bodies along Boston’s Freedom Trail, but also driving Detective Jake “Sundance” Cooper to the edge of insanity as the cop fights to redeem an imploding career. Through an investigation revealing the true madness and evil of this killer, Jake’s mentor, Detective Mo Blackhall, is on the verge of being indicted for his role in a Big Dig corruption scandal, putting Jake at the center of choosing blue blood loyalty over moral truth. Strap yourself in and prepare for an intense ride of suspense, mystery and police procedural drama, with a captivating and honest look at the underbelly of Boston’s mean streets, driven by a cast of characters reminiscent of Dennis Lehane’s greatest fiction.